KIF7 is a Kinesin-4 family member that has been shown to play an important role in embryonic development and may play a role in the development of basal cell carcinomas. KIF7 functions in Hedgehog (Hh) signaling through the negative and positive regulation of the GLI family of transcription factors (i.e., GLI1, GLI2, and GLI3)1. While the mechanism of this regulation is still being elucidated, it appears that in the absence of an Hh ligand, KIF7 negatively regulates GLI transcription factor activity, and in the presence of Hh signaling it positively influences GLI dependent signaling; possibly through KIF7’s Hh-dependent translocation from the base of primary cilia to the tip1. Mice lacking KIF7 exhibit a similar phenotype to mice lacking the GLI3 transcription factor, which is characterized by polydactyly (i.e., extra toes) and exencephaly (i.e., brain is located outside the skull)2. Loss-of-function mutations in the KIF7 gene in humans results in ciliopathies that can lead to lethal developmental abnormalities (e.g., Acrocallosal and fetal hydrolethalus syndrome) or less severe developmental defects (e.g., Meckel and Joubert syndromes)3,4. Given the important role of Hh signaling in the development of basal cell carcinomas (BCC) and other cancers5, it will be interesting to see if research in this area also uncovers a role for KIF7 in Hh signaling-dependent cancers. Cytoskeleton continues to expand their offerings of kinesin, dynein, and myosin motor assays with high signal to noise ratios. Recently, we have developed an assay for KIF7 (Kinesin-4 family) using the recombinantly expressed and purified KIF7(1-370) motor domain. 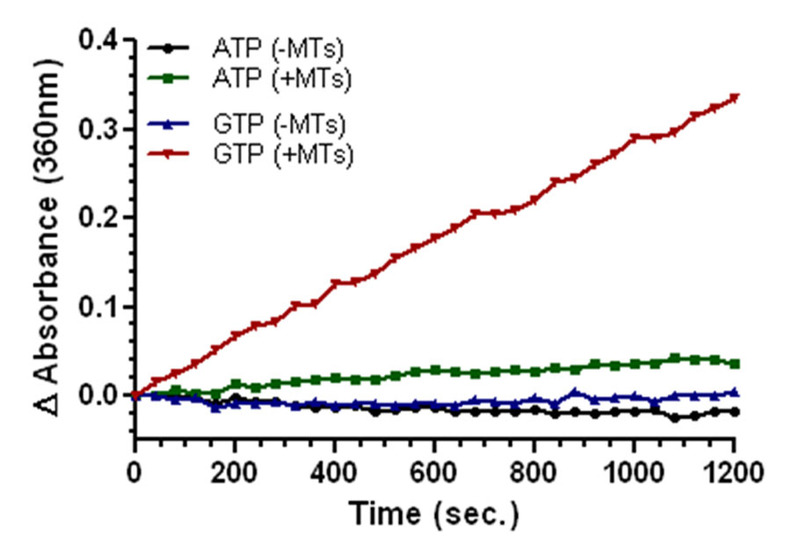 This E. coli-expressed protein is >80% pure and when tested with our ATPase/GTPase Kinetic ELIPA Kit (Cat# BK051/52), we discovered a very strong microtubule (MT)-dependent GTPase activity (Fig. 1). This was a very unexpected finding given that kinesins are typically characterized as having MT-dependent ATPase activity. Consequently, these data either suggest a bona fide nucleotide preference of the KIF7 motor domain for GTP over ATP, or perhaps the GTPase activity is actually coming from tubulin in the MTs in a manner that is enhanced by KIF7. It is noteworthy that the kinesin heavy chain, Kinesin-1 family, is able to utilize GTP as well as ATP for its motor activity6. Additionally, other members of the Kinesin superfamily of motor proteins have been shown to modulate tubulin polymerization (Kinesin-7 and -10 family members)7 or MT depolymerization (Kinesin-8 and -13 family members)8, which are processes that are expected to affect the level of tubulin GTPase activity. At Cytoskeleton, we have developed assays and purified proteins for 11 recombinant Kinesin motor domains that represent 8 of the 14 recognized Kinesin families9. In addition, we have developed assays and proteins of cytoplasmic dynein and cardiac, skeletal, smooth, and non-muscle myosins, as well as an in vitro re-constituted cardiac sarcomere. These assays are available as a compound screening service with individual motors as well as multi-motor protein panel projects. If you need a different motor protein or assay, we offer custom protein expression/purification and assay development services to help move your project forward. For more information on available proteins and services, contact tservice@cytoskeleton.com for more information. Figure 1: Figure 1. KIF7(1-370) Motor Domain Activity. 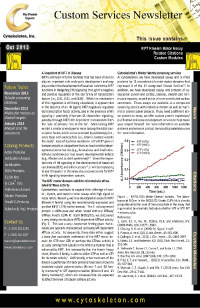 The absorbance at 360 nm in the BK051/52 Kinetic ELIPA kit is directly proportional to the level of free phosphate in the assay that is generated by enzymatic hydrolysis of either ATP or GTP. MT = microtubules. Liem K.F. Jr., He M., Ocbina P.J.R., and Anderson K.V. 2009. Proc. Natl. Acad. Sci. U.S.A. 106, 13377-13382. Cheung H.O. et al. 2009. Sci. Signal. 1:ra29. Putoux A. et al. 2011. Nat. Genet. 43, 601-606. Dafinger C. et al. 2011. J. Clin. Invest. 121, 2662-2667. Goetz S.C. and Anderson K.V. 2010. Nat. Rev. Genet. 11,331-344. Paschal H.S. et al. 1987. J. Cell Biol. 105, 1273-1282. Friel C.T. and Howard J. 2012. J. Muscle Res. Cell. Motil. 33, 377-383. Walczak C.E., Gayek S., and Ohi R. 2013. Annu. Rev. Cell Dev. Biol. 29, 417-441. Lawrence, C.J. et al. 2004. J. Cell Biol. 167, 19-22.